Google Assistant got the custom routines feature in May but Google is now extending its functionality starting with the US. Google Assistant is getting Scheduled Routines to allow the users to set the time and day to trigger a set of defined actions. Google first introduced the ability to use Routines to invoke a number of actions with one command back in March, so being able to schedule a string of actions instead of manually invoking them seemed like the obvious next step. 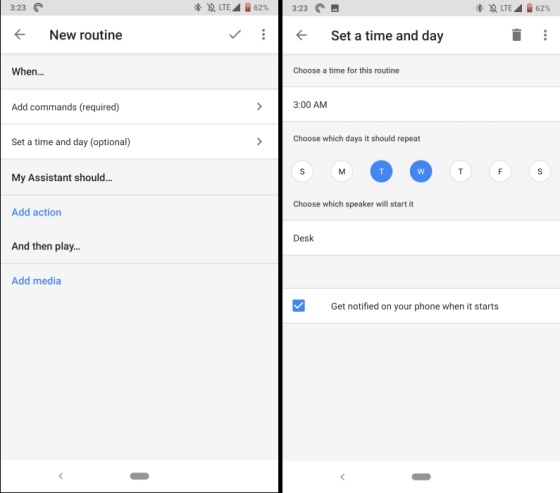 As for how this feature works, you will now see a new ‘Set a time and day’ option in the ‘New Routine’ interface under Google Assistant settings. It will appear under the ‘Add commands’ option in the same menu. Under the routine scheduling window, you’ll see options including ‘Choose a time for this routine,’ ‘Choose which days it should repeat,’ and ‘Choose which speaker will start it’ to help you make the feature work. For example, you can build your own a routine to start at 7:00 pm (or whatever time you return home) every week day and set it to read the news or play your favorite music while you freshen up. There’s also the option to get notified when the routine starts on your phone itself, where Google Assistant will send you a notification when it kicks off each evening. This has been one of the most requested features that brings Google Assistant-powered speakers a step closer to Amazon Echo, giving users a chance to customize the use to their needs. Google Assistant has recently received a ton of impressive updates, including new voices, Continued conversation and a new ‘Visual Overview’ page. The Scheduled Routines have only gone live in the US, so we will still have to rely on ‘Shortcuts’ for custom commands.